In the sixth part of our program, we’ll demonstrate a very interesting exercise. Boomerang is a challenging exercise, involving many muscles, where we try to maintain a balance in the body’s movements in space. 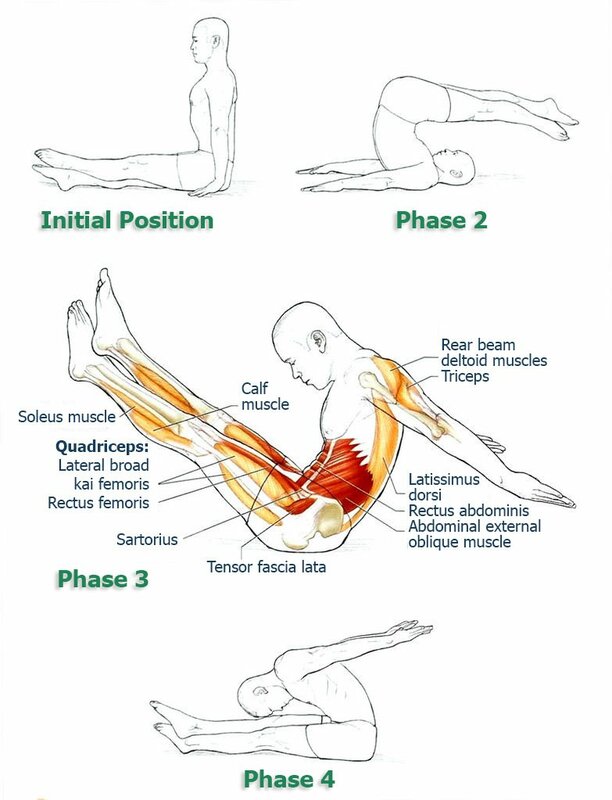 The exercise aims to improve core muscle strength and to coordinate the movement precision of your body. Breathing out, roll backwards, as described in the 2nd phase. Repeat the exercise 6 times, changing the position of the feet. After the last repetition, return to the starting position. Mental image – as the name suggests, imagine your body as a boomerang, not only in form, but also by the nature of the movements. Correctly thrown boomerang flies in an arc and always returns to the starting point, just like we do during the exercise. Boomerang – a complex exercise that includes maintaining a stabilizing force at the center, and maintaining a balance in the body’s movements in space. It involves many muscles, but their work is aimed not only at improving muscle strength, but also to coordinate movement precision of your back and control of the center core muscles. The aim of the exercise is dynamic stretching of the posterior group of thigh muscles, and the spine and arm extensor muscles. Boomerang contains elements of some of the previous exercises from this series. Do not perform it until you have obtained the proper execution experience from those exercises and consult your doctor to make sure the exercise is suitable for you. If you lack flexibility in the posterior group of thigh muscles, you can slightly bend the knees when lifting the legs and when bending forward (3rd and 4th phases). It will be less challenging, but the movement precision of your back should still see improvements.